Could Sub-$50 Crude Oil Sink Marine Financing in the GOM? By Richard J. Paine, Sr. The Gulf of Mexico basin is com- some are in transit, down for maintenance or otherwise prised of areas of various depths. Ap- not actively producing. 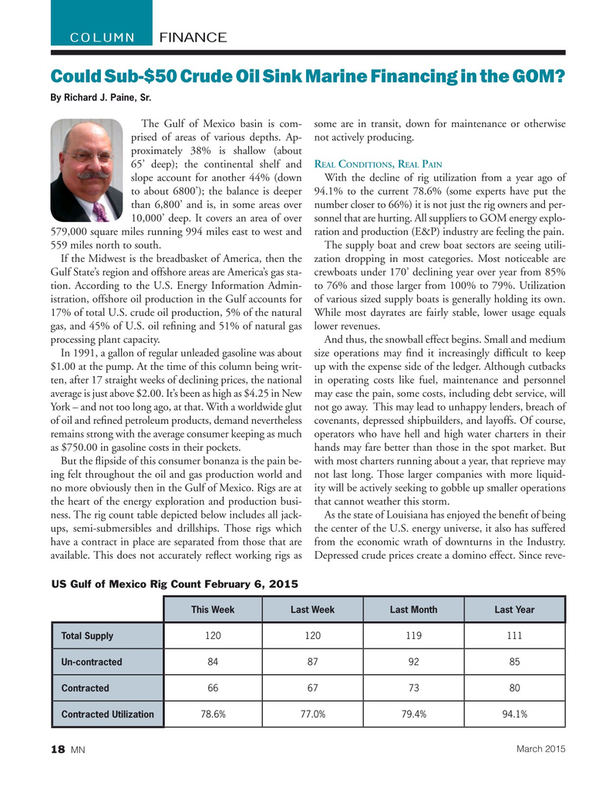 EAL ONDITIONS EAL AIN 65’ deep); the continental shelf and R C , R P slope account for another 44% (down With the decline of rig utilization from a year ago of to about 6800’); the balance is deeper 94.1% to the current 78.6% (some experts have put the than 6,800’ and is, in some areas over number closer to 66%) it is not just the rig owners and per- 10,000’ deep. It covers an area of over sonnel that are hurting. All suppliers to GOM energy explo- 579,000 square miles running 994 miles east to west and ration and production (E&P) industry are feeling the pain.